When Tim and Emily Campbell, owners of Jackson Paper in Sylva, began discussing the possibility of donating the 900 acres of land at the lower end of Yellow Creek Valley in Graham County, they turned to Mainspring Conservation Trust. “They are strategic thinkers who really consider the end results,” Tim Campbell says. Mainspring, a land trust whose project area includes the six western counties in North Carolina (formerly known as the Land Trust for the Little Tennessee), had purchased the property in 2008 and developed a forest restoration plan to restore the degraded condition of the property with its extraordinary diversity of habitat. Part of the innovative plan included the first prescribed fire crossing private and public boundaries in Western North Carolina, in partnership with the U.S. Forest Service. 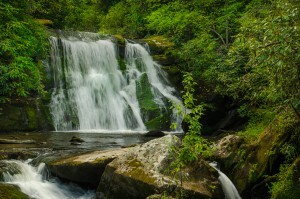 The organization also developed a trail that leads to Yellow Creek Falls, a popular put-in for paddlers. In 2013, Mainspring sold the property to Tim and Emily Campbell, who kept the trail to Yellow Creek Falls open for public access and placed a conservation easement to protect the property from inappropriate development. The couple considered using the salvaged wood from the restoration efforts to provide fuel for Jackson Paper but logistics weren’t right for that use. Instead, they began looking at ways others could benefit from the property. NWTF plans to use the property in a variety of ways, including conservation education programs, mentored youth hunts and fishing, and habitat demonstrations, just to name a few. Active wildlife and forest management will continue to be a priority on the area.